Luke was the first figure to join my collection. He came by way of my wonderful wife, who gave him to me for my birthday. I don't think she realized at the time what she started! She had been on the prowl for gifts and asked Jeremy what he thought would be a good Star Wars themed gift. He recommended The Black Series 6 Inch figures, as he had picked up a few and really liked them. I can only say that I couldn't appreciate the recommendation any more! Growing up, Return of the Jedi was my favorite of the Star Wars films, and Luke was my favorite character. I'm not sure if it was the epic space battle, or Luke's green lightsaber, but I simply couldn't get enough! This figure stays pretty true to Luke's character in ROTJ, down to his black gloved hand. And oh, how pretty that green lightsaber looks! Luke's face detail and the overall paint application is good (I would hope, as most of the figure is one color...), but this is also where I have a bit of a problem. 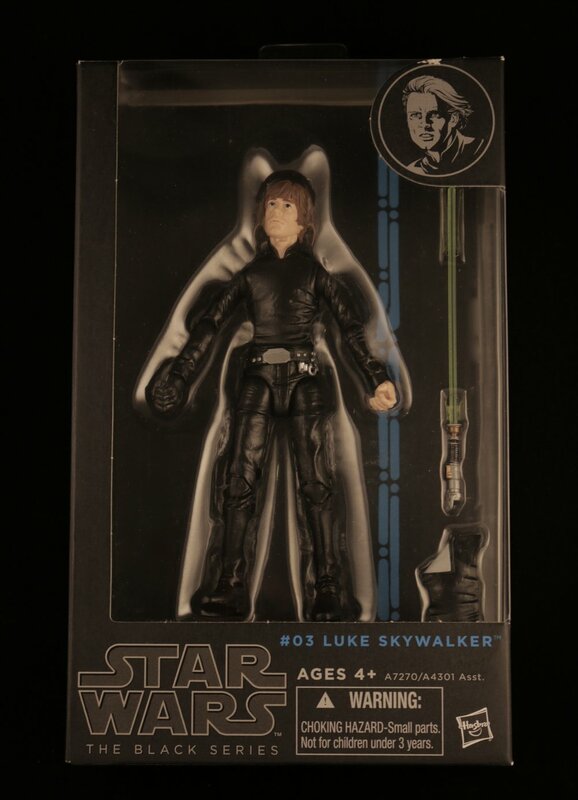 The one gripe I have is that although Luke's clothes in the film are in fact black, there is little variation in the overall color on the figure. Yes, it was probably much cheaper and easier to stick with one shade over the entire figure, but by the time Luke get's to the Emperor's throne room, I would think his clothes would be showing at least a little bit more wear. This figure is true to the film and represents the pivotal point in Luke's journey. And I sure hope we get to see his green lightsaber in Episode VIII! There is a bit to be desired as far as the detail, but overall it's a figure that would be a great addition to any collection!